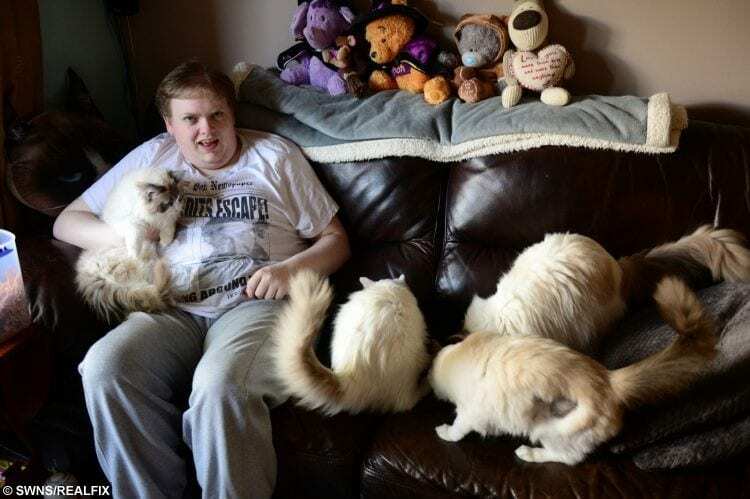 A 28-year-old man who suffers from an ultra-rare condition is being helped through his illness – by having SIXTEEN therapy cats in his home. Ian West suffers from has eosinophilic oesophagitis, an allergic inflammatory condition of the oesophagus. He also has cyclic vomiting syndrome, which usually affects children and can result in repeated vomiting fits. The distressing attacks can last for up to three weeks and Ian, who has also been brain damaged since birth, finds it difficult to trust strangers. 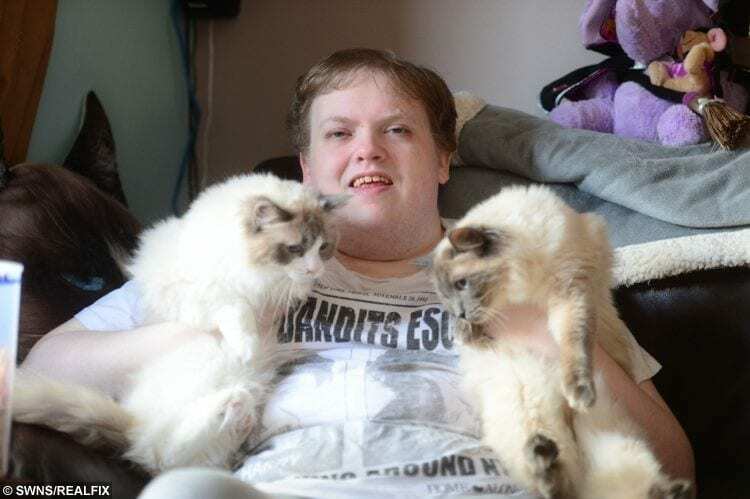 But the animal lover is now being helped through the rare condition by the cats who live at his house in Biddulph, Staffs. 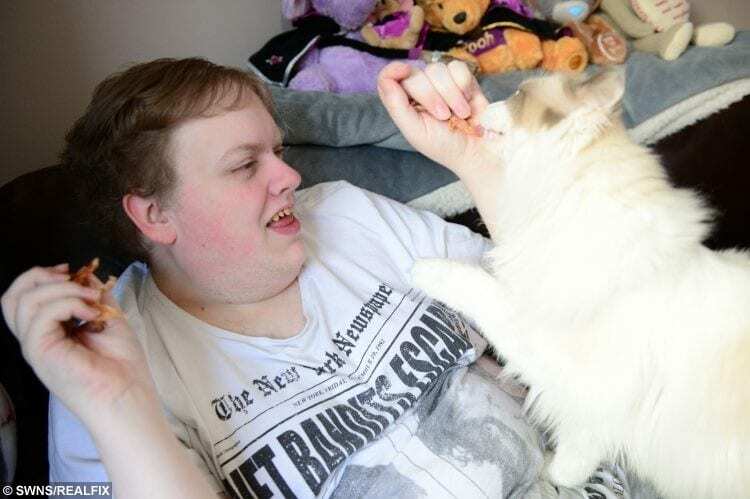 Mum Tina, 53, said having the feline companions in his home has made a massive difference to her son’s life. Ian West (28), has brain damage and is one of two people in the world that has eosinophilic oesophagitis and CVS, which means he has violent sickness every five to ten minutes when he has an outburst. She added: “A lot of people do not understand the extent of the condition which has made it difficult for Ian to trust strangers. “It is the strength of the attacks that is the most shocking. They are constantly violent attacks. “Ian loves cats and when he is having an attack all he wants is to be near Willow and it does help him. “We have 16 cats and they are his babies. “He loves them all so much, but Willow is definitely the favourite. It can bring him out of the attacks if he can cuddle Willow. “He is at his happiest when he is sat down with his family and the cats, watching a film or television. He likes shows like M.A.S.H and NCIS. “The therapy cats are just big balls of fluff. We breed them for other families where they would usually cost thousands of pounds. Anything can spark Ian’s vomiting attacks, which doctors can’t explain by any other infection or illness. Cyclic vomiting syndrome normally clears up by the time the child becomes an adult but in rare cases it can affect people into adulthood. Tina said her son is one of the very few cases in the world to have the condition at his age and severity. She added: “The attacks can be nasty and long-lasting. They can last up to three weeks. “We do not know what starts them they can be when he is happy, sad, angry or calm. “The only obvious trigger is when he is ill.
“Ian was diagnosed aged five and you lose track of time over the years when Ian was very young and would be throwing up every five to 10 minutes. “Doctors were not sure what it was. “We got an appointment with Great Ormond Street Hospital and they knew straight away because the vomit didn’t smell. “We have had to drive back from Cornwall because he was being sick every five minutes for the entire drive. “It must have looked mad with us driving along with sick coming out of the car. Tina said Ian also has mental health conditions, which are similar to to the autistic spectrum but have not yet been formally diagnosed. She added: “Ian also has thousands of teddies and if we move one of them he will know that we have and then know which one has been moved. “Ian is easily scared and that can bring on an attack but he is also a very loving and friendly boy. “Ian is his own person and definitely has his own personality. “He will watch a film and then print off the pictures he likes and the different characters. “He puts them up on the wall and he calls it his work.